Once upon a time, after I earned my PhD in May 2006, I pursued getting my dissertation published with an academic press. I actually got a serious bite from a university press (one amongst dozens to whom I sent out the book proposal). But after nearly two years of non-followup-communication from that publisher (and after two years into a permanent full-time faculty position at a community college), the pressure to get my dissertation published was no longer there. Thus, my manuscript just sat there — mothballed. However, I would find myself referring to my dissertation to my composition students. Surprisingly, it was not as an example of Flannery O’Connor scholarship (although I was and still am proud of what I accomplished), but as an example what a successful result of the writing and research process CAN BE — if they only trusted in the process. So, world, here it is — “My Kind of Comedy”: An Exegetical Reading of Flannery O’Connor. In this academic study, “MY KIND OF COMEDY: AN EXEGETICAL READING OF FLANNERY O’CONNOR AS MEDIEVAL DRAMA” deciphers Flannery O’Connor’s fiction through the lens of medieval biblical exegesis and the English dramatists of the medieval miracle, mystery, and morality plays. 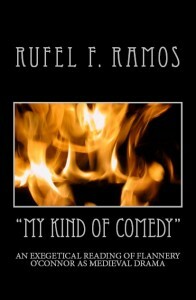 “MY KIND OF COMEDY” peels away the grotesque dark comedy and tragedy in O’Connor’s mid-twentieth century novels and short stories and reveals underneath a master of a unique Christian comedic tradition that goes back over 500 years. This entry was posted in Publications and tagged dissertation, Flannery O'Connor, scholarship. Bookmark the permalink. Pingback: “Chapter 2: Creative Non-Fiction Examples” from STARTERS | I Am the Lizard Queen!